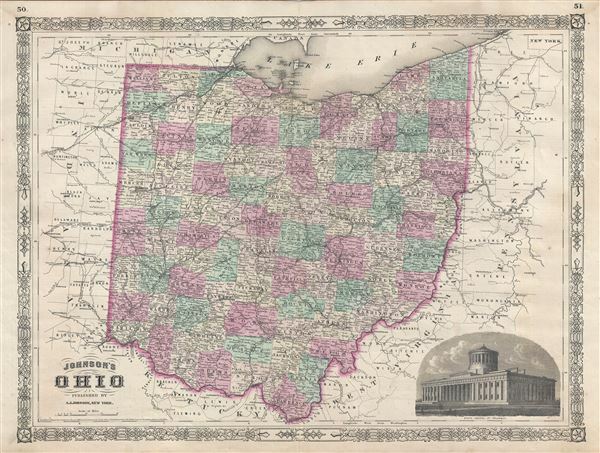 This is A. J. Johnson's beautifully hand colored first edition 1866 map of Ohio. This map shows cities, topographical features, railways, ferries and roads with color coding at the county level. Johnson introduced this large folio map in the 1864 edition of his atlas, replacing the single page Ohio map that he inherited from Colton. The expanded map was necessary to account for the boom in Ohio's population that occurred in the previous decade. An engraved view of the Columbus state house appears in the lower right quadrant. The map features the fretwork style border common to Johnson's atlas work from 1863 to 1869. Although copyrighted to 1864, this map was published by A. J. Johnson as plate nos. 50 and 51 in the 1866 edition of his New Illustrated Family Atlas of the World.